Egyptomania and its effect on the culture of Hollywood. How much of modern culture is influenced by the past? Despite today's actors, artists and creative types all wanting to create something fresh, the hands of time often reach back and pull a project into the modern era. Indeed, although the civilizations might be different, the thoughts, feelings, conflicts and emotions are timeless. In fact, the cyclical nature of life and its ever-present themes are due to be the subject of a new series. Titled Cleopatra and written by Michael Seitzman, the project will be Freeform's first period drama. After NBC initially bought the series back in 2012, Freeform took up the mantle and have given it the greenlight for release in 2019. Why now? With gender issues and women's equality coming under scrutiny in recent times, the producers are using Cleopatra as a vehicle to tackle modern issues. Reaffirming that old topics never die, the show will depict how a female rose to power in a less egalitarian society than we have today. Of course, it's not always the case that artistic ventures look backwards to move forwards. 2018's Ready Player One was Steven Spielberg's attempt to capture the zeitgeist of human's gradual immersion into an alternate universe. Costing $175 million, according to Variety.com, to make and almost that again to market, the adaptation of Ernest Cline's is based in the year 2045 and uses today's penchant for virtual reality to tell a story of survival and escape. However, when you scroll through the annals of pop culture, the ancient world is one that never seems to go out of fashion. In fact, as the forthcoming revival of Cleopatra suggests, our fascination with Ancient Egypt is as enduring as the iconic Pyramid of Giza. Even as far back as the Ancient Romans, Egyptian culture was spreading its influence. From landscaped gardens and Egyptianized status of Antinous to the worshipping of Egyptian deities, the Romans took a lot of inspiration from their predecessors. In modern times, the 19th century saw Europe gripped by Ancient Egyptian tributes and artefacts. Following Napoleon's 1798 invasion of Egypt and the subsequent release of Description de l'Égypte, Egyptomania saw Europeans go wild for the culture. Jean-Fran?ois Champollion's 1822 work deciphering hieroglyphics only added to the spread of Ancient Egyptian influences across the continent into the 20th century. Although interest ebbed and flowed over the decades, the love of pyramids and pharaohs never truly faded after the rise of Egyptomania. Noted crime writer Agatha Christie was famously hot on the Egyptian culture. The wife of archeologist Max Mallowan, Christie had the historical knowledge to give her novels the accuracy necessary to make the stories both believable and relevant. Death on the Nile (1937) was the first voyage into a world of scarab beetles and hieroglyphics. Turned into a hit movie starring Peter Ustinov in 1978, Christie followed up with Death Comes as the End in 1944. With Ancient Egypt's gilded edge starting to offer a golden backdrop for creative works of fiction, the latter half of the 20th century saw the gradual diversification of the genre. Movie theatres soon became portals back to a different era as directors and scriptwriters began the now-familiar process of telling modern stories through an ancient envoy. Although not the first, Joseph L. Mankiewicz's Cleopatra (1963) is considered one of the most notable Hollywood productions about the ancient culture. Starring Richard Burton and Elizabeth Taylor, the movie chronicles the life of the famous queen from her impressive rise to her later struggles. In what can be seen as a testament to the popularity of Ancient Egypt as a thematic device, the movie ran way over its original budget. By the time the costs had been tallied up, Cleopatra cost Twentieth Century Fox and its investors a reported $31 million (equivalent to $251 million in 2018). Despite the unanticipated costs, Cleopatra went on to gross $71 million worldwide ($575 million in 2018) and prove that the long-since-gone civilization was a hit with movie-goers. Indiana Jones is arguably the most successful Egyptian-themed franchise since Cleopatra, with Harrison Ford's six gung-ho adventures raking in just short of $1 billion ($939,177,554 between 1981 and 2008) according to Box Office Mojo. Even if Jones was the peak of the pyramid, that hasn't stopped directors from digging deeper into the catacombs of Ancient Egypt. As we've noted, Alex Proyas was "clearly in a playful mood" when he directed Gods of Egypt (2016). Smarter and less cliched than the story would suggest, the movie sees gods and pharaohs battle for supremacy. The beauty of Gods of Egypt is that it didn't take itself too seriously. By laughing and allowing others to laugh at it, the movie was a surprise hit that year. From the big screen to the small screen, Egyptomania has found its way into our homes through a variety of mediums. For comic fans, Marvel's Kang lived as pharaoh Rama-Tut after going back in time to recruit Apocalypse. Across the divide in the DC Comic universe, Blue Beetle and Hawkman both have roots in Ancient Egypt. For TV audiences, sci-fi shows have a particular penchant for traveling back to the ancient world. The stars of Star Trek, Doctor Who and Babylon 5 have all walked among the pyramids. Continuing this trend, the gaming industry has embraced the theme in a big way. By far the most recognizable is the Eidos Interactive hit, Tomb Raider. First released in 1996, the franchise has produced 19 games to-date with 2018 seeing the release of Shadow of the Tomb Raider. From these console games, spinoff movies and, interestingly, alternative games have emerged. On the casino gaming side of the spectrum, Lara Croft has appeared in various slot games. In fact, that's merely the tip of the pyramid in the iGaming industry. For the best part of two decades, Egypt has become a popular slots motif. Rise of the Pharaohs is one of the most recent examples that gives Cleopatra the power to unlock a progressive jackpot when she forms the right combination across five reels and 15 paylines. Moving away from the world of movies, TV and games completely, many of the things we do today are borrowed from the Egyptians. Archaeologist William Matthews Flinders Petrie was the first person to discover the precursor to a game we now call bowling. Further evidence to back up the claim bowling was born in Ancient Egypt came courtesy of Professor Edda Bresciani, an Egyptologist at the University of Pisa. Analyzing artefacts from Narmoutheos, Bresciani and his team concluded that some houses contained lanes and stone balls. Beyond bowling, wigs, glass, door locks and even toothpaste all came from the Ancient Egyptians. In fact, it's because of these links that the theme has become such a rich source of material for creative types. As well as leaving an imprint on our minds through its various myths and legends, Egypt has left a physical mark on our culture. In other words, the pyramids will always be visible on the horizon when it comes to creating movies, TV shows and more. 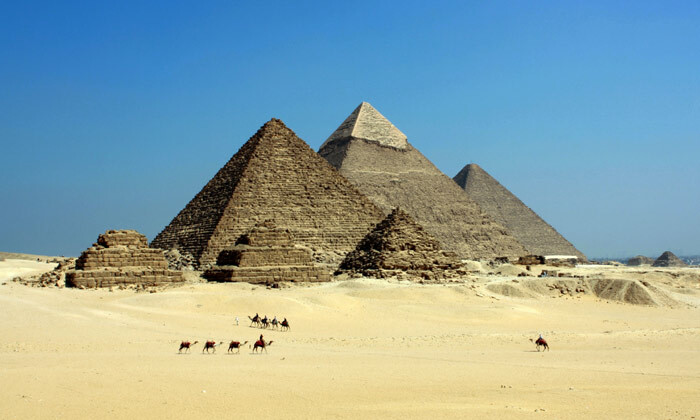 Because of the unbreakable connections we have to the ancient civilization, Egypt will continue to provide an interesting way of illuminating some aspect of modern life, which is why it's a trope we can't bury.